T-Mobile today announced that it was altering its existing Simple Choice plans, adding more data, a new pricing tier and no-added-cost international texting from the United States. Simple Choice plans still start with one line at $50 per month for unlimited data, talk and text on the T-Mobile network. You only have to decide how much high speed 4G LTE data you want. And now on the core plan, you’ll get a full 1GB of 4G LTE data and tethering – double the previous amounts. Additional lines continue to be $30 for the second line and $10 for up to three additional lines for unlimited data talk and text, and now 1GB of 4G LTE data. 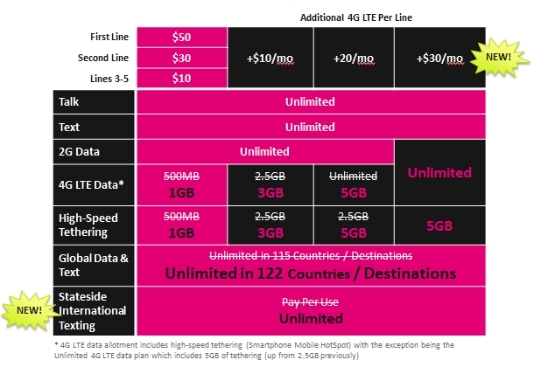 Previously, T-Mobile's Simple Choice plans included 500MB of 4G LTE data in the base $50 per month plan, while users could get 2.5GB of 4G LTE data for an extra $10 per month and unlimited 4G LTE data and 2.5GB of tethering for an extra $20 per month. Now, users will get 1GB of 4G LTE data in the base plan, 3GB of 4G LTE data for an extra $10, 5GB of 4G LTE data and 5GB of tethering for an extra $20 and unlimited 4G LTE data and 5GB of tethering for an extra $30. In addition, T-Mobile has added unlimited international texting from the United States at no extra cost. The data changes will take effect automatically on March 23 and the international texting will begin on April 1. While the unlimited 4G LTE data for an extra $20 per month will be removed, users who have the plan before March 23 will be grandfathered into, and allowed to keep, the plan. I just switched to T-Mobile from Verizon last week. It's still pretty early for me, but so far I think the benefits outweigh the downsides. Yes, the coverage isn't as good. However, it's great where I am most of the time and I'm actually getting BETTER speeds on T-Mobile LTE than on Verizon (wasn't expecting that)!! And the price being lower is the biggest benefit. And complete flexibility to do anything I want and not worry about contracts. So far I don't have switchers remorse. Awesome! We just switched from Verizon last week, clearly it was a great choice. You're locked in at $20 for unlimited as long as you're signed up before March 23. No kidding. The only downside is those who have unlimited data must pay an extra $10 for it now, but the upside of these announcements far outweighs the downside... at least for me (I use it in addition to my ATT phone solely for international data). Adding 7 more countries to the list is great! Keep up the disruption T-Mo! You've already cut my AT&T family plan in half, thanks! I think you might be a bit too excited and didn't read carefully what T-Mobile offers. It's not DATA, it's TEXTS. Plus, I read "from the United States" to mean that you will still get charged for texting while roaming in Europe, so you should check this. T-Mobile's data is generally much more expensive when roaming overseas than AT&Ts. With AT&T, I used to be able to at least pre-pay for 50MB of data at about $1 per MB. T-Mobile usually works out to over $2 (sometimes well over) per MB. It's their biggest disadvantage, IMO. I would love to be wrong, but don't think I am. Also, on the iPhone, T-Mobile blocks tethering, at least in my case. My Android phone, which is on the same plan, does not have tethering blocked. T Mobile includes free international data. It is not texts. It is data, and it is free. I pull down a ton of email and internet while traveling, and it has not cost me a penny. I really struggle to understand why you bothered to post what you did when you so clearly have absolutely zero idea what you are talking about. Around the world right? What kind of data speeds do you get? Never actually tested the speeds, but it looks like the free data is 3G. It certainly felt fast enough to me - email and web pages generally loaded up pretty quickly. Our family switched over to T-Mobile a little less than a year ago, and we've been satisfied with the service overall. The coverage here in western Washington state has been as good as AT&T's (our previous carrier). Verizon's coverage may be somewhat more ubiquitous out in the sticks, but we left them a decade ago because they're a horrible company - so they're irrelevant to us. Really the only "complaint" was my daughter tends to use a bit more than half a gig of data a month, so she wasn't happy with the slowdown towards the end of each month. This increase solves that, though. I'll have to see if the new baseline will be enough to let me drop the extra $10 a month I'm paying on my line (for 2 gigs more, monthly) - I do like to stream MLB audio, and the season is about to start. Anyway... If you're thinking about making the switch, I say you should go for it! Yay! So glad I switched. Can't wait to freely use my iPhone on my trip to Europe next month without worrying about data and such.